Precision cut by Lazare Kaplan, 2.05 cts. 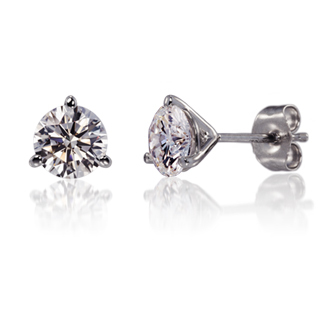 total weight round brilliant diamonds SI1-G, Set in Platinum martini style settings. In 1936, Lazare Kaplan gained international fame when he successfully cut the 726-carat Jonker diamond, after a year of planning. This was an extremely complex stone, which could have been destroyed if the plans of other cutters who had examined it had been followed. The tradition of striving for the utmost skill and ingenuity in planning and cutting operations has remained the same over the years. LKI also continues to enjoy a reputation for imaginative planning, excellence and consistency of product, strict attention to quality control, precise grading and pricing and has an excellent working relationship with customers.